We'd order the rearview camera in our Expedition. Visibility isn't great to the rear, and it's a massive vehicle, with big potential to damage other vehicles, if you estimate a parking space incorrectly. It hasn't been brought up to date like the company's pickup trucks, but the Ford Expedition has one of the best cabins and designs among the biggest SUVs. 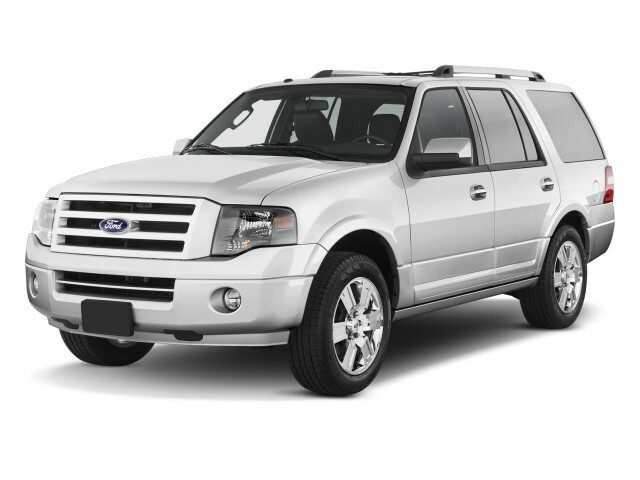 The formula for the 2014 Ford Expedition sport utility vehicle is familiar: Take the underpinnings of a full-size pickup truck (In this case, a now-dated version of Ford's well-known F-150) and use them for a full-size utility vehicle that can seat up to eight people. In that segment, it's similar to vehicles from the Cadillac, Chevrolet, and GMC brands of General Motors, along with Nissan and Toyota as well. The Expedition thus remains resolutely truck-based even as mid-size utilities like the Ford Explorer evolve into crossovers based on passenger-car platforms. It's at its best when called upon to pull with the ruggedness of a truck, making a useful choice for those drivers who really need to tow many thousands of pounds or haul heavy loads. With an all-new 2015 Ford F-150 coming, complete with aluminum body, the Expedition is now based on a pickup from two generations earlier. That means that while the pickups got crisper, the lines of the Expedition retain the more rounded look of 10 years ago. Inside, too, interior fittings and the dashboard are clearly from an earlier era--both less refined and plainer than those of any modern Ford truck. We've waited for Ford's latest 5.0-liter V-8 to make its way into the Expedition since 2012, but it hasn't happened. The sole drivetrain for the Expedition remains the proven but power-shy 310-horsepower, 5.4-liter V-8 that the big utility has had for years. 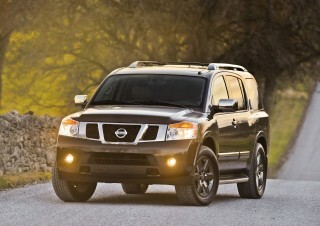 It makes 365 pound-feet of torque and allows the Expedition to move quickly most of the time. 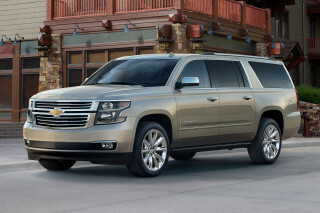 Hitch up a trailer or load up the vehicle to near its capacity (up to 9,200 pounds for towing) and this engine doesn't have the stout, unrelenting character of GM's current batch of V-8s—especially the larger V-8 used in the Suburban. Four-wheel drive remains available pretty much throughout the entire lineup, and the six-speed automatic transmission is responsive and smooth-shifting, at least. The two main versions of the Expedition differ in length. You can select either the standard-length Expedition or the extended-length Expedition EL, which is 14.8 inches longer overall, with longer rear fenders and glass. It's one of the biggest SUVs on the planet, frankly, and its wheelbase of 131 inches is longer than the full length of either a Smart fortwo or Mitsubishi i-MiEV. In either case, you'll need to plan your parking spaces with some care. Both versions of the Expedition provide a cavernous interior, almost like that of a full-size van. Cargo space is more abundant and third-row access is much easier in the EL, but you'll pay a price in even more cumbersome maneuverability than the standard version. The Expedition's front seats are captain's chairs, mounted high and affording a good view out, and a telescopic steering wheel and power-adjustable pedals allow for a vast range of body types. The expansive head and knee room continues in the second row of seats, and even adult passengers will find the third row spacious enough for short trips. In EL models, there's 130.8 cubic feet of cargo space, including an additional 24 cubic feet behind the third-row seat. A PowerFold third-row seat and power liftgate arrangement are handy when hands are full, and the EL's longer rear doors make getting into (and out of) the third row quite easy. Considering the Expedition's mammoth size, driving it is quite easy thanks to light but precise steering, as well as a suspension that does a good job in controlling all that weight. Yes, it's one of the biggest land yachts on the market, but it's manageable. The only issue we've noted in prior years is that the pedal feel of the brakes can be somewhat spongy. Ride quality isn't up to the standards of modern crossovers, for the most part, but the Expedition does keep its composure on rougher surfaces, and it rides better than other body-on-frame trucks. The Expedition has fallen behind on features compared to its pickup brethren. It lacks Ford's innovative (and sometimes frustrating) MyFord Touch connectivity interface, instead offering the more dated Sync system, combined with a voice-activated navigation system and HD Radio in top trims. The lineup includes XL, XLT, Limited, and King Ranch trims, with a total of ten equipment groups. Standard equipment across the entire range includes keyless entry keypad, heated power mirrors, air conditioning, an electrochromic rearview mirror, illuminated visors, and a leather-wrapped steering wheel, while Ford's MyKey system and SecuriCode keypad-entry system are standout features. 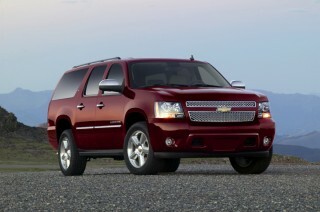 Options include a DVD entertainment system, and 20-inch chrome-clad aluminum wheels. If you can afford it, the King Ranch edition offers a unique spin on a luxury-SUV interior, with unpolished leather like that of a baseball glove. The 2014 Ford Expedition hasn't changed much in appearance for years; but those who buy this model for its truck roots aren't going to mind. The 2014 Ford Explorer has aged with the years, now looking like a remnant of past years of SUV glory. That's largely because it hasn't kept up with the F-150 truck on which it's based–where the F-150 has gone through several iterations and improvements over the several years, the Expedition has seen little change. It's rounder now than the F-150, which has much edgier, crisper lines. Inside, it's a bit worse; because Ford has come so far in such a short time with respect to interior design, the Expedition's cabin really is the relic of another era. There are quite a few subpanels and trim pieces meeting at squarish and straight edges, punctuated with round vents, and a shelf running full length across the dash. Of note is the now-dated mix of faux-wood, dull plastics, and matte-metallic surfaces that are used as trim. The Expedition has great tow ratings, and it handles well for such a large vehicle; but acceleration is short of other models in this class. 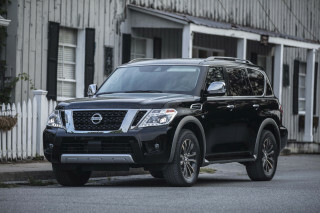 While the 2014 Expedition may be a little on the sluggish side of the full-size SUV segment, its strong towing abilities and surprisingly crisp handling keep it from being a disappointment behind the wheel. Considering the Expedition's mammoth size, driving it is quite easy thanks to light but precise steering, as well as a suspension that does a good job in controlling all that weight. Yes, it's one of the biggest land yachts on the market, but it's manageable. While other rival models have stepped up the game in power and torque in recent years, the Expedition remains powered by the same 310-horsepower, 5.4-liter V-8 that its had for years. 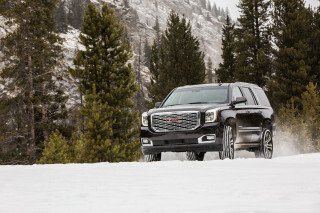 It makes 365 pound-feet of torque and allows the Expedition to move quickly most of the time; but hitch up a trailer or load the Expedition near its limit (up to 9,200 pounds for towing) and this engine doesn't have the stout, unrelenting character of GM's current batch of V-8s—especially the larger V-8 in the Suburban. Four-wheel drive remains available pretty much throughout the entire lineup, and the six-speed automatic transmission is responsive and smooth-shifting. The only issue we've noted in prior years is that the pedal feel of the brakes can be somewhat spongy. The interior of the 2014 Expedition is just as spacious as the exterior suggests, and ride quality is great. The 2014 Ford Expedition is as big inside as it looks outside–it's truly cavernous, nearly rivaling the spaciousness of full-size passenger vans. Ride quality isn't up to the standards of modern crossovers, for the most part, but the Expedition does keep its composure on rougher surfaces, and it rides better than other body-on-frame trucks. If you can afford it, the King Ranch edition offers a unique spin on a luxury-SUV interior, with unpolished leather like that of a baseball glove. The ride of the Expedition is certainly no match for the newer generation of car-based crossovers, but it rides better than other body-on-frame trucks. The suspension does a splendid job of soaking up irregularities while keeping the back wheels glued to the road over rough surfaces, with none of the nervous hopping that characterizes solid-axle designs. Both a well-designed power liftgate and the PowerFold third-row seat make living with such a large vehicle—and making the most of it—easier than you might think, especially again for smaller moms. With the third-row seat raised, the standard Expedition has almost 20 cubic feet of cargo space available. And in EL models, there's 130.8 cubic feet of cargo space, including an additional 24 cubic feet behind the third-row seat. Theere haven't been any recent crash tests for the Expedition, although it has bulk on its side—plus a good roster of safety features. The Insurance Institute for Highway Safety (IIHS) hasn't rated the 2014 Ford Expedition for safety, but it has earned decent ratings from the National Highway Traffic Safety Administration (NHTSA). It gets four stars out of five overall, with four-star ratings for frontal crash and rollover for both the standard and extended-wheelbase models--though the rear-wheel-drive extended model alone gets just three stars for rollover. All models get five stars from the NHTSA for side crash safety. In addition to all the requisites, Ford fits the Expedition with standard side-impact airbags, and the Expedition's curtain airbags extend protection to all three rows of seats. The Expedition also includes Trailer Sway Control as a standard feature; it works with the stability control system and takes extra measures—such as applying precise braking and reducing engine torque—to bring both vehicle and trailer under control. Ford has moved the mechanism for the power tailgate away from the ceiling, eliminating the hump that you get in some models. 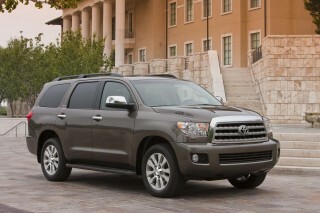 But there's an option for a backup camera, and we strongly recommend it due to the Expedition's poor rear visibility. Ford's programmable MyKey system allows parents to program a speed limiter, speed alert chimes, and additional belt reminders. Special models like the King Ranch—plus a great list of features and options—let you choose exactly what fits your lifestyle. The only thing that's missing is the latest infotainment wizardry. 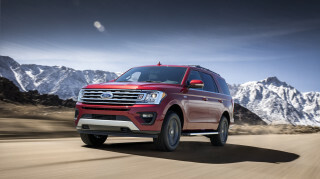 Ford hasn't yet given the Expedition its update MyFord Touch infotainment system–instead opting for a very dated Sync system–showing yet another sign of the full-size SUV's age. As far as equipment goes, that's probably the only disappointment in the lineup of XL, XLT, Limited and King Ranch models. Every Expedition gets standard air conditioning, power windows, locks and mirrors, a keyless entry keypad, and a leather-wrapped steering wheel. Standout options include Ford's MyKey system and SecuriCode keypad-entry system. This year Ford has added a new dual-head-restraint DVD system, and a new 20-inch chrome-clad aluminum wheel design. The optional voice-activated navigation—with a 6.5-inch color touchscreen—isn't bad; it's just an older unit, and DVD-based. But it does include a nice-sounding 340-watt AM/FM stereo with MP3 playback, six speakers, a subwoofer, and an iPod jack. Our favorite, if you have a generous budget, remains the King Ranch, which gets its own marvelous untreated leather interior. It looks and feels and even smells like a baseball mitt, and requires upkeep, showing the warts and scuffs accumulated through the miles. The 2014 Ford Expedition has fuel efficiency that's entirely unimpressive. If you're shopping for a full-size SUV like the Expedition, you're probably not too concerned about fuel economy–or at least you shouldn't be. Rear-wheel-drive models are rated at 14-mpg city, 20-mpg highway, while four-wheel drive Expeditions only get 13/18, respectively. It's always worth considering the use of the vehicle. If you plan to put all three rows of seating to work most of the time, the Expedition's useful efficiency becomes that much better. Keep the Expedition in the garage until it's really needed, and it's considerably greener. Again, we suspect that Ford is giving the Expedition short shrift because while the F-150 pickup line--from which the Expedition is derived--now has a new lineup of V-8 and V-6 powerplants that have boosted its fuel economy considerably, these powertrains are still missing from the Expedition. 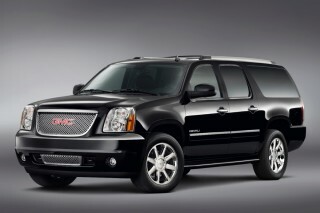 Compared to the equivalent Chevy and GMC models the Expedition has more cargo space and leg room. The dials and gauges are much simpler to understand and work with than a 2012 GMC Acadia I had for two years... 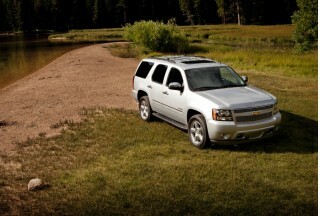 Compared to the equivalent Chevy and GMC models the Expedition has more cargo space and leg room. The dials and gauges are much simpler to understand and work with than a 2012 GMC Acadia I had for two years. My current 2014 Expedition has a better ride and is much quieter than my 2014 MKS. I prefer my truck to my MKS on long trips.